The glacier extends through the Illulisat Icefjord, surrounded by mountains. Icebergs calve off from the main glacier, pile up and block the fjord before being released into Qeqertarsuup Tunua (Disko) Bay and Davis Strait. The whiter areas in the fjord are piledup icebergs and the “real” glacier ends where the greyish striped section ends – showing that this image is from 2001. The graph shows glacier-velocity profiles for 1985 to 2006. 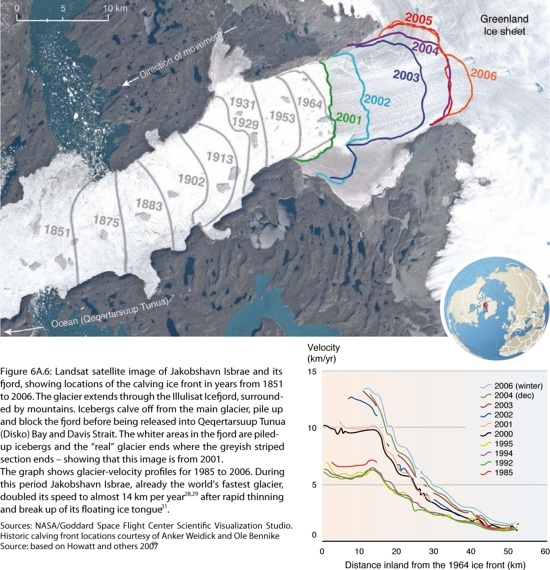 During this period Jakobshavn Isbrae, already the world’s fastest glacier, doubled its speed to almost 14 km per year, after rapid thinning and break up of its floating ice tongue.